This is useful if you want to programmatically produce multiple types of output. 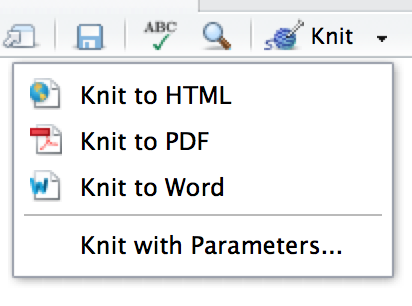 RStudio’s knit button renders a file to the first format listed in its output field. You can render to additional formats by clicking the dropdown menu beside the knit button. Each output format is associated with an R function. You can either write foo or pkg::foo. If you omit pkg, the default is assumed to be rmarkdown. It’s important to know the name of the function that makes the output because that’s where you get help. For example, to figure out what parameters you can set with html_document, look at ?rmarkdown::html_document. Note the special syntax if you don’t want to override any of the default options. pdf_document makes a PDF with LaTeX (an open source document layout system), which you’ll need to install. RStudio will prompt you if you don’t already have it. word_document for Microsoft Word documents (.docx). odt_document for OpenDocument Text documents (.odt). rtf_document for Rich Text Format (.rtf) documents. md_document for a Markdown document. This isn’t typically useful by itself, but you might use it if, for example, your corporate CMS or lab wiki uses markdown. github_document: this is a tailored version of md_document designed for sharing on GitHub. You can view it in a web browser, and see the rendered output. Unlike html_document, this rendering always includes an embedded copy of the source code that generated it. You can edit it in RStudio. When you open an .nb.html file, RStudio will automatically recreate the .Rmd file that generated it. In the future, you will also be able to include supporting files (e.g. .csv data files), which will be automatically extracted when needed. html_notebook gives you a local preview, and a file that you can share via email. github_document creates a minimal md file that you can check into git. You can easily see how the results of your analysis (not just the code) change over time, and GitHub will render it for you nicely online. You can also use R Markdown to produce presentations. You get less visual control than with a tool like Keynote or PowerPoint, but automatically inserting the results of your R code into a presentation can save a huge amount of time. Presentations work by dividing your content into slides, with a new slide beginning at each first (#) or second (##) level header. You can also insert a horizontal rule (***) to create a new slide without a header. beamer_presentation - PDF presentation with LaTeX Beamer. revealjs::revealjs_presentation - HTML presentation with reveal.js. Requires the revealjs package. Each level 1 header (#) begins a new page in the dashboard. Each level 2 header (##) begins a new column. Each level 3 header (###) begins a new row. Flexdashboard also provides simple tools for creating sidebars, tabsets, value boxes, and gauges. 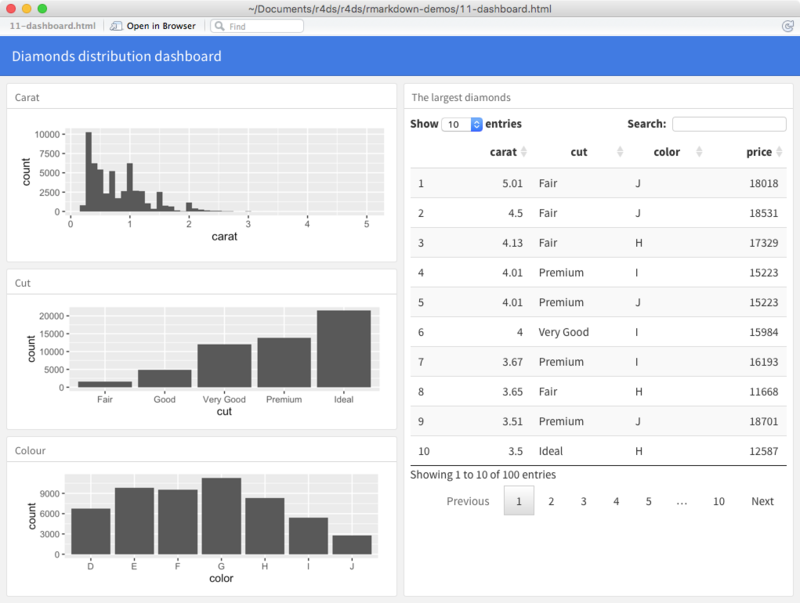 To learn more about flexdashboard visit http://rmarkdown.rstudio.com/flexdashboard/. Any HTML format (document, notebook, presentation, or dashboard) can contain interactive components. HTML is an interactive format, and you can take advantage of that interactivity with htmlwidgets, R functions that produce interactive HTML visualisations. For example, take the leaflet map below. If you’re viewing this page on the web, you can drag the map around, zoom in and out, etc. You obviously can’t do that in a book, so rmarkdown automatically inserts a static screenshot for you. dygraphs, http://rstudio.github.io/dygraphs/, for interactive time series visualisations. DT, http://rstudio.github.io/DT/, for interactive tables. threejs, https://github.com/bwlewis/rthreejs for interactive 3d plots. DiagrammeR, http://rich-iannone.github.io/DiagrammeR/ for diagrams (like flow charts and simple node-link diagrams). To learn more about htmlwidgets and see a more complete list of packages that provide them visit http://www.htmlwidgets.org/. You can then refer to the values with input$name and input$age, and the code that uses them will be automatically re-run whenever they change. Learn more about Shiny at http://shiny.rstudio.com/. Put your .Rmd files in a single directory. index.Rmd will become the home page. Execute rmarkdown::render_site() to build _site, a directory of files ready to deploy as a standalone static website, or if you use an RStudio Project for your website directory. RStudio will add a Build tab to the IDE that you can use to build and preview your site. The bookdown package, https://github.com/rstudio/bookdown, makes it easy to write books, like this one. To learn more, read Authoring Books with R Markdown, by Yihui Xie, which is, of course, written in bookdown. Visit http://www.bookdown.org to see other bookdown books written by the wider R community. The prettydoc package, https://github.com/yixuan/prettydoc/, provides lightweight document formats with a range of attractive themes. The rticles package, https://github.com/rstudio/rticles, compiles a selection of formats tailored for specific scientific journals. See http://rmarkdown.rstudio.com/formats.html for a list of even more formats. You can also create your own by following the instructions at http://rmarkdown.rstudio.com/developer_custom_formats.html. To improve your presentation skills, I recommend Presentation Patterns, by Neal Ford, Matthew McCollough, and Nathaniel Schutta. It provides a set of effective patterns (both low- and high-level) that you can apply to improve your presentations. If you give academic talks, I recommend reading the Leek group guide to giving talks. I haven’t taken it myself, but I’ve heard good things about Matt McGarrity’s online course on public speaking: https://www.coursera.org/learn/public-speaking. If you are creating a lot of dashboards, make sure to read Stephen Few’s Information Dashboard Design: The Effective Visual Communication of Data. It will help you create dashboards that are truly useful, not just pretty to look at. Effectively communicating your ideas often benefits from some knowledge of graphic design. The Non-Designer’s Design Book is a great place to start.